Hello all, Recently I used this logo on a rally shirt! I want to put it into my portfolio but wanted to get some feedback on it since I have kind of been designing in a bubble lately. Here is the link if you want to buy one! Get this Blues Rally Shirt HERE! Thank you everyone, all feedback is welcome! LET'S GO BLUES!!!!!!!! I'd meant to start this series last week...some douchebag dumping yard waste behind the garage can be "thanked" for the delay. In any event, the wait is over, and the Blues come marching in. Once again, the Sharks step in to take the Seals' place. Blues' striping style is that of their original white jerseys (but throwing navy in the mix), while the Sharks' striping is from the Seals' second white jersey, complete with shoulder numbers. 70s Night's opponent will be the Blackhawks, WitH A twist you might like. Sorry for flooding the boards with concepts recently, but I've just been on a roll. Here's a redesign for the St. Louis Blues, which utilizes their 90's wordmark in a unique and semi-modern fashion. The 5 stripes create 6 spaces, which is for the staff used in every musical piece ever. Rip it apart! Hey everybody! 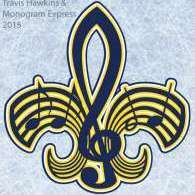 I was trying to make a roundel logo for the St. Louis Blues without using their "wing note" logo. I kept the Gateway arch and added gold/yellow to it, I made 5 lines (representing sheet music and water) at the bottom to show that St. Louis is on the Mississippi River, and the words St. Louis Blues to it. I also included the color red to represent Missouri's flag (and because the Blues once used red). But the problem is that it needs something else. I'd like some advice on what to add or take out. A bit of advice on how to make the arch look more 3d would be great as well. Wolves hockey jerseys and logos. Just looking for any feedback. I noticed the new logo that the Saint Louis Blues the now parent club of my beloved Chicago Wolves is getting for next year. Also, the circular logo for the St. Patrick's day jerseys and new alternate jersey the Wolves gave me an idea to create a new circular for a St. Louis inspired look. Only for a brief time did the Wolves have a patch to show their affiliation with a NHL team and that was with the Thrashers on the alternate black jerseys they had years ago. So why not make a jersey and logo or emblem that pays homage to the NHL parent club but is truly Chicago. I do have plans on sending this to the Wolves all the designs. First the the circular logo designs: I used just the Wolves head (but not the stick and puck) which I traced in Inkscape. The Chicago skyline i drew It has numerous things that are part of Chicago. I couldn't think of one for it like the Arch on St. Louis other than "the Bean", so I have the Sears Tower, John Hancock, Navy Pier, the Chicago Water Tower, the Thompson Center, the Harold Washington library, 900 N. Michigan building by the Hancock and a building that is just South of the Sears Tower. Numbers 4, 9 and 10 use font styles the Wolves have used with 9 and 10 using the actual wordmark. Numbers 1,2,3,6,7,8 and 10 all use numbers the Wolves have used in the for jerseys.I did make a St. Patrick's day one the numbers on there I am pretty sure were used by the team for a St. patty's day jersey. about 10 years ago. Critiques greatly welcomed always. I do want to send this to the team soon. Maybe not for next season but maybe the near future. Thank you for your time.